When it comes to rugged walkaround fishing boats, the Robalo R245 proves its merit. 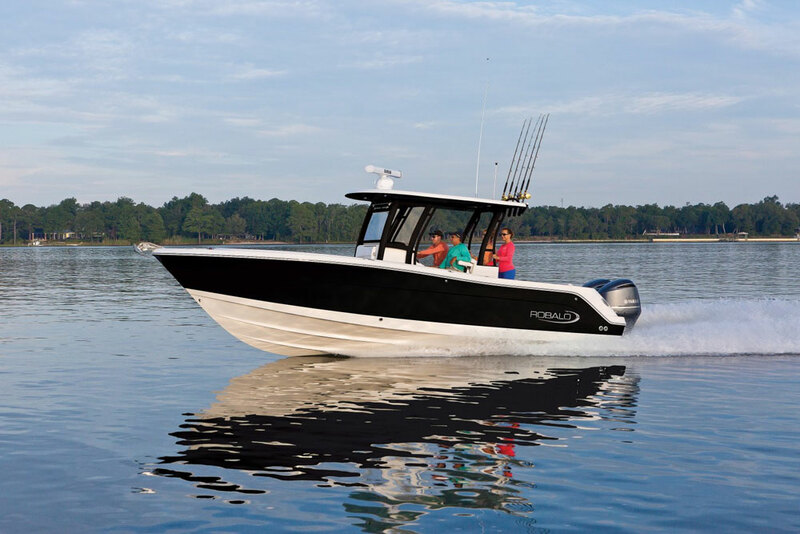 If you read our review of the Robalo R180 center console, you probably remember the use of words like ”stout,” “heavy,” and “tough”. 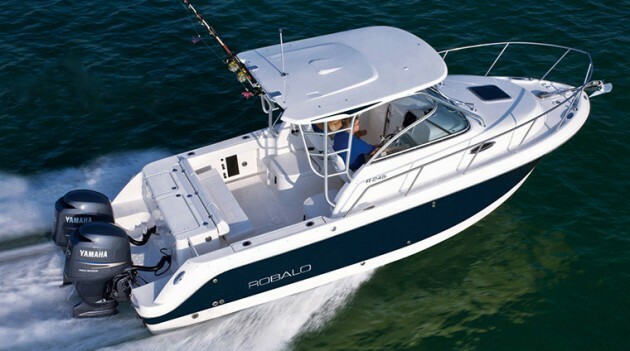 Spend a day or three aboard a Robalo R245, and you’ll be using those very same words. 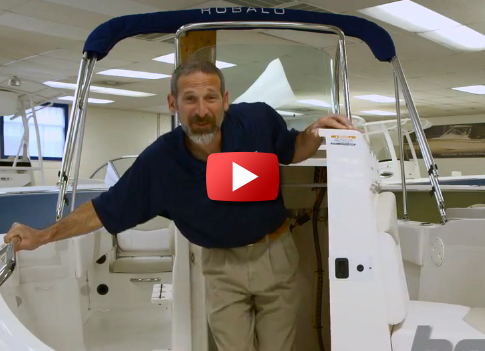 Robalo has a reputation for over-building their boats, and it’s a well-deserved one. In fact, I ran one of their walkarounds for an entire season of offshore fishing, and absolutely nothing on the boat broke—not a single snap, hinge, or hatch. 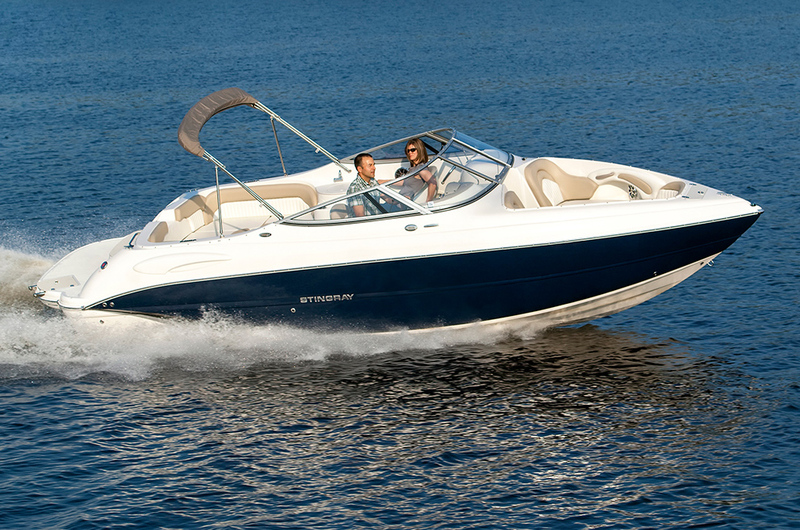 If you want a boat that’s built like a bull, this is it. 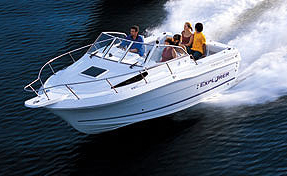 The number-one feature of the Robalo R245 is it's over-built construction - this is one tough boat. 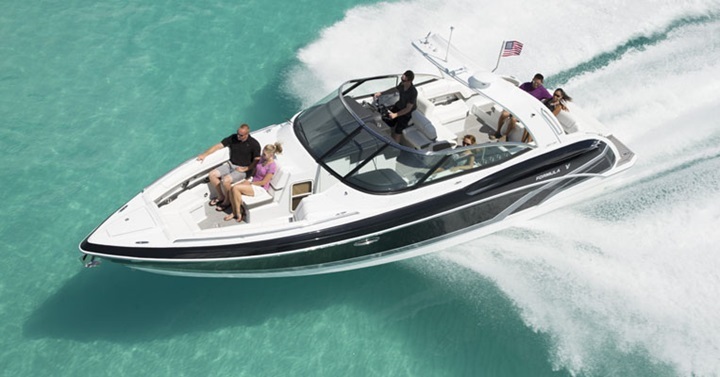 Wait a sec, over-built boats are also quite often over-weight, and the R245 tips the scales at 5,533 pounds—a good 25 to 50 percent heavier than most in this class. 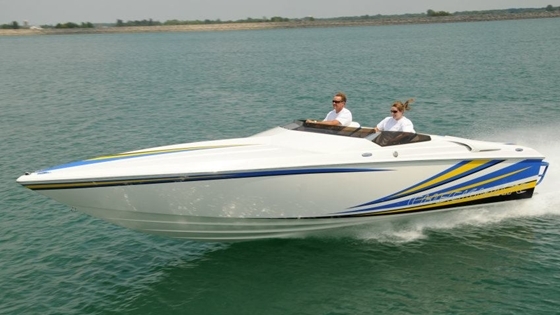 Don’t many high-end builders strive to make their boats lighter, so they go faster and run more efficiently? Sure. And yes, you do pay a price for that extra weight, in the form of reduced speed and efficiency. Not that it’s sub-par, however; with a pair of F-150 Yamaha four-strokes the R245 cruises at just over 30-mph while getting about 2.1 mpg, and top-end hits 45-mph. Those numbers would be a bit higher, if the boat was significantly lighter. But there’s an up-side to weight, too. The R245 has a heck of a lot more mass and momentum than most of its competitors, and when you smash into a steep wall of water at high speed, instead of banging against it this boat shoves it out of the way. It isn’t just built like a bull—it acts like one, too. Until, that is, you go fishing. Then the R245 starts acting more like a carnivorous predator than an burly herbivore. It has a 30-gallon livewell which is lighted with LEDs and is finished in baby-blue gel coat, to keep your baits calm and healthy. Six rods stow in horizontal racks, and four gunwale holders come standard. There’s also a built-in two-drawer tacklebox. And 40-gallon overboard-draining fishboxes are built into the captain’s and passenger’s seat bases. They’re just big enough for 50-pound fish and you may out-class them when big bluefin are on the inshore lumps, but they’re also amazingly well insulated; when I had that Robalo for a season (it was the R235, the 245’s predecessor) I tested the fishboxes against a standard Igloo cooler and a collapsible fish-bag, and found that they kept ice nearly twice as long and chilled fish by a solid 10-degrees better. 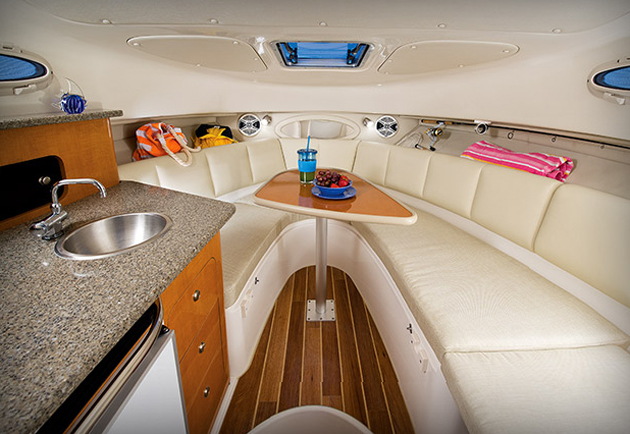 Inside the cabin of the R245 you'll find a basic galley, V-berth, and dinette table. Test conditions: Calm seas, winds 5 - 10 knots, 2 POBPower: Twin Yamaha F150 outboards, swinging 14.25" x 17" three-bladed stainless-steel props. Performance figures courtesy of Yamaha. As is true of most walkarounds of this size, the cockpit is about right for three anglers and can hold up to four, five if you reel with your elbows tucked in. The cabin is also about as you’d expect, with a V-berth, a head beneath it, and a collapsible dinette table. Unlike many in this class it also comes with a standard freshwater system and sink, and if you really want to get crazy, you can add a 12-v 5,000 BTU air conditioning system. But that adds about $6,300 to an already-hefty MSRP that starts right around $100K, and how often do you really need AC on a 24-footer, anyway? The bottom line? If you want a light, super-fast fishing machine, look elsewhere. 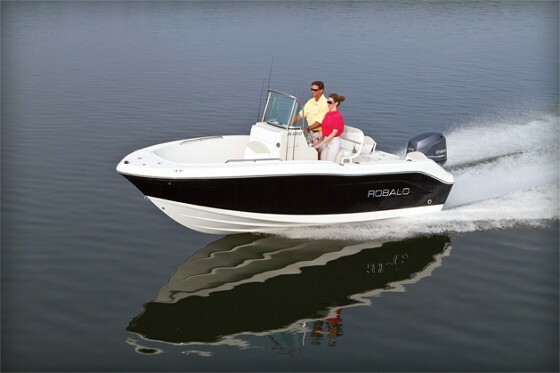 If you want a cheap—ahem, I mean inexpensive—walkaround, you shouldn’t be looking at the Robalo R245. 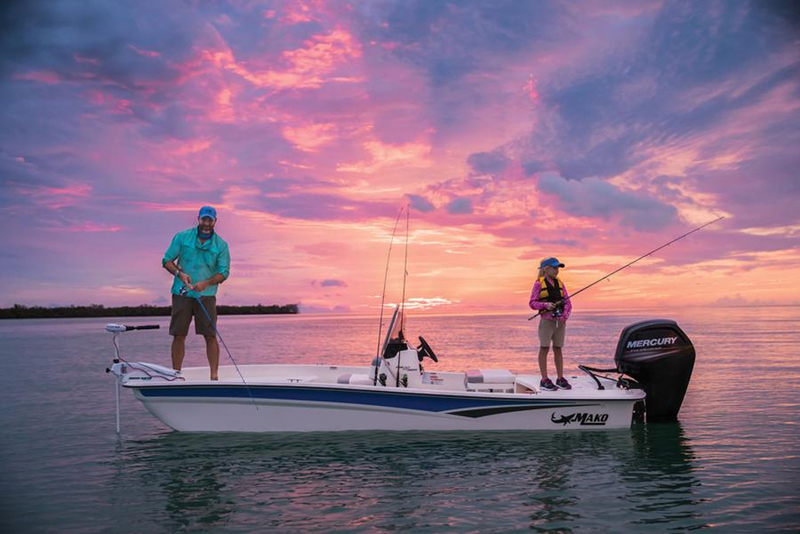 But if you want a small boat that has a cabin, offshore fishing capabilities, and is built like a brick you-know-what, make sure this one’s on your must-see list.